The Global Consortium for Sustainability Outcomes (GCSO), a non-profit international network of universities working with implementers to deploy and scale solutions to sustainability challenges, today announced the winners of its second round of seed grant awards. Five teams, including sustainability experts from 10 GCSO member universities, will each receive seed funding to support projects designed to accelerate sustainability outcomes. “This is an incredibly strong cohort of GCSO-funded projects. Collectively, they address a wide-range of important sustainability challenges, build strong international partnerships with various implementation agents, and that will yield sustainability impacts and outcomes around the globe,” said GCSO Director Jennifer Carter. This project will scale an innovative strategy of measuring sustainability and community health indicators in real time using wastewater as a diagnostic matrix. Participants from Arizona State University (U.S.), Dublin City University (Ireland), King’s College London (U.K.), and Tecnológico de Monterrey (Mexico) will collaborate to improve global health outcomes by reducing endocrine disruptors, drug resistant bacteria, and abuse of addictive substances. Award: US$100,000. 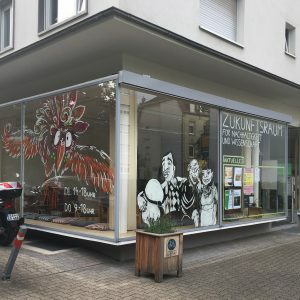 Project participants will implement and scale a Language for Sustainability solution that combines scientific research, education, and tourism to protect biodiversity in indigenous lands. Sustainability solutions teams from Arizona State University (U.S.), Leuphana University of Lüneburg (Germany), and the National Autonomous University of Mexico (Mexico) will engage Indigenous Peoples in the Amazon and Mexico to develop communities that are ecologically and economically sustainable. Award: US$81,700. GCSO collaborators from Arizona State University (U.S.), City University of Hong Kong (Hong Kong), Leuphana University of Lüneburg (Germany), and Portland State University (U.S.) will work with local stakeholders in each region to develop enterprise plans pertaining to land trusts (Portland), urban agriculture cooperatives (Hong Kong), plant-based protein SMEs/B-Corps (Lüneburg/Hamburg), and mill-bakery cooperatives (Tempe/Phoenix). This project will build capacity of 200 present and future food entrepreneurs and food actors to found, run, and support sustainable food enterprises and endeavors. Award: US$70,000. This project uses renewable energy to support communities in emerging markets. 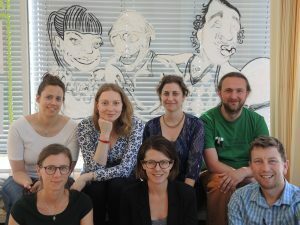 Sustainability solutions experts from Arizona State University (U.S.) and Karlsruhe Institute of Technology (Germany) will collaboratively design and implement new energy access projects with implementing organizations working to drive sustainable development through energy innovation in Africa, Asia, and Latin America. Award: US$50,000. This project will engage thousands of cities to help them more effectively utilize sustainable public purchasing (SPP). GCSO collaborators from Arizona State University (U.S.), Hong Kong University of Science and Technology (Hong Kong), and King’s College London (U.K.) will develop and widely disseminate knowledge about SPP best practices, thus helping cities worldwide to make their purchasing decisions more sustainable. Award: US$78,000. The energy in the room was powerful. Twenty men and women from around the world had traveled to Tempe, Arizona, for this moment. Alone, each might be able to change their own small corner of the globe. Together, they might one day change the world. Eleven universities, one corporation — leaders in sustainability — working together to create sustainable outcomes on a global scale. It was clear from the dialogue over the course of their two days together that this was the goal of every founding member at the first-ever meeting of the Global Consortium for Sustainability Outcomes. When you’re a world leader in sustainability science, you know that the challenges are growing faster than their solutions. From poverty, terrorism and climate change to ocean acidification, food insecurity, water shortages and disease — the world is quickly recognizing how these problems negatively affect human well-being. Universities are ideal places to develop and test solutions to these challenges. Often universities can implement solutions on a small scale with local partners. The nascent consortium empowers its members to achieve solutions on a global scale. 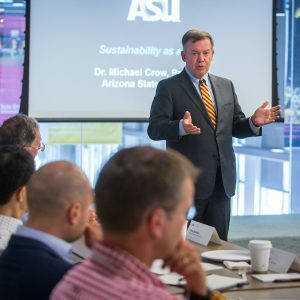 The founding meeting began Monday with a welcome from Arizona State University President Michael M. Crow, who described the depth of the challenge and his excitement to join forces with other universities to make sustainability both a value and an outcome. That charge has motivated the Julie Ann Wrigley Global Institute of Sustainability since its founding in 2004. It is the reason the university has joined like-minded partners in forming the consortium. ASU is a dues-paying member of the consortium and provides staff and operational support. The Global Consortium for Sustainability Outcomes (GCSO) is a global network that transforms ideas into action. What does success look like? It could be research that leads to a new solution, or an existing solution confirmed as functional or improved based on testing. It could be that a proven solution is implemented in a different location, industry sector or social context. Equally important, success includes expanding capacity — whether enabling organizations and institutions to implement sustainability solutions or teaching students the skills they need to do so. It also includes submitting successful proposals for funding from other sources. By joining together to form the consortium, members increase their global connections with partners who share a common desire to make sustainable change at a global scale. They increase their eligibility for funding from agencies around the world. They expand their pool of knowledge and skills. Each member pays annual dues to the nonprofit, member-governed organization; 100 percent of membership dues are used to support member activities. Near the end of the first day of meetings, Remus Pricopie, rector of the National University of Political Studies and Public Administration in Romania, expressed a sentiment echoed by many others in the room. His university did not join the consortium to compete against other consortium members for funding, Pricopie said. Rather, they joined because they expected to get their investment back many times over — not only financially, but also through the very real benefits of collaboration, international connectivity and the catalytic effect that contributes to sustainability impact. “This could open up new possibilities for my institution, my country, the world,” Pricopie said.